Also noticed my BR was reset to 3,000, was that a thing they did or does it happen after not logging in for a long while? Elisa Zwei, Amy White and Rinka BR. Do you have some kind of mental illness? These were made back during the [hu] lucky cube rush. So the answer is yes, you do? I'm glad that order isn't reset, I haven't even finished the first time. Ask someone to hit you in a match until red hp. Have someone shoot at you while you hop. You'll get lots of contrib for being shot at. Afterwards he can get you low HP and you do damage to NPCs orso. I had someone help me out with that, and later did it for someone else too. I'm impressed with Hyoka's dedication. 3rd ball was Diana. She stays in garage forever untuned. Maybe make a build with him. I do have a scram mod leftover. Only the last one isn't a duplicate. Everyone who plays this game does. and just for the record, my rolls were pretty much the opposite. So many Melfis/School Rennys/Nataschas. I rolled 3 Bikini Illumises in a row this morning too. All but Bikini Rouche BF are considered good. Can't say much about School Series since I never rolled. All of your zeroes are good. Pretty sure all of the Pritzl series are considered good. I don't know much about Zwei, though. 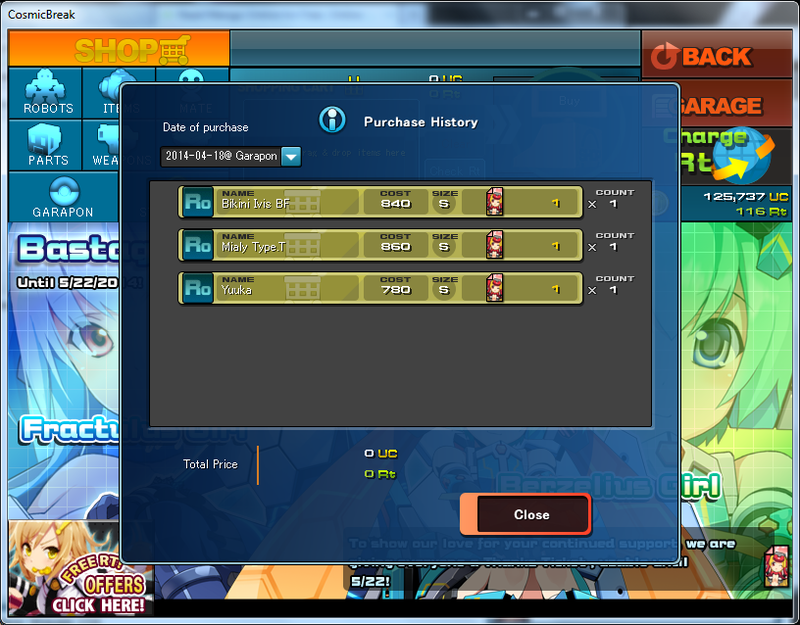 I did roll Zwei on some other players' accounts so I could double check. Dunno about most of the Valentine series, but Fia V apparently can't mount Magfrit? That's disappointing. Shana is expensive for what she does but good. VEIL is gimped compared to even that. Everything else should be good. All of Moonlight can be considered good. Anko is decent, but you might want to relocate her wp to another bot. Both of Mythology is good. Both of Hero are fun, but not amazingly great. Ask someone else about Misunagi. Not sure about A.L.E Lazflamme but she's cool okay. Amy White is not as good as Amy imo but still good. Lambda is pain to tune but good. Kururu is underrated but good. Rinka BR should be good. Abyss Jikun Hu is good. Fia V's Magfrit is her WB.